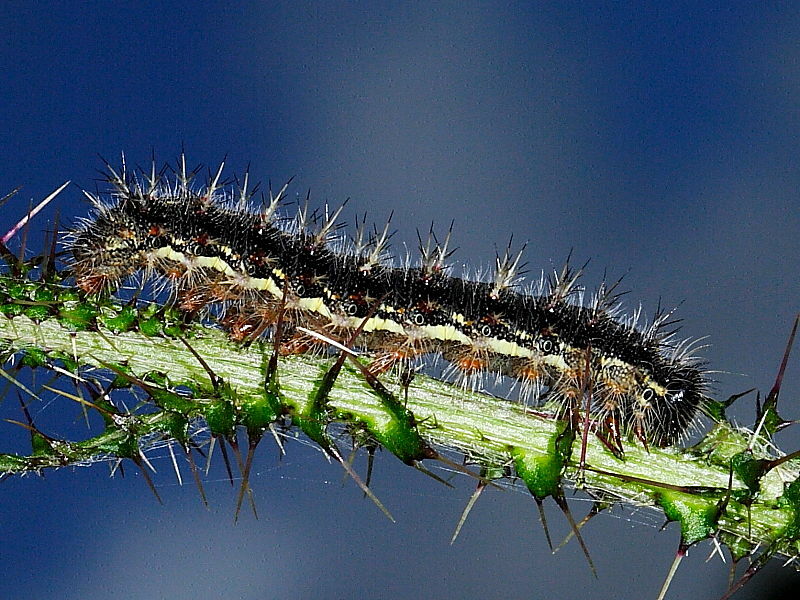 Why do caterpillars change their skins? Caterpillars are eating machines and hence most grow very quickly, some capable of doubling their size in few days. 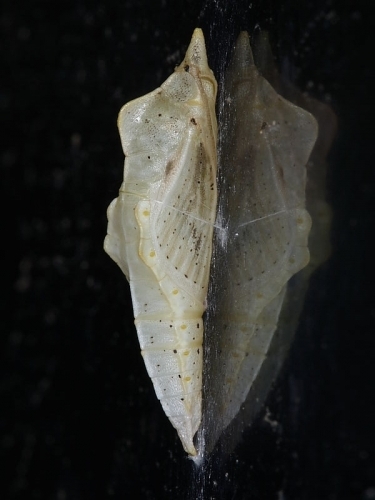 This exceptional growth rate means their skins are soon stretched until they are unable to expand any further. 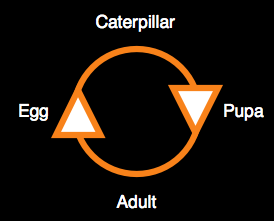 When this point is reached the caterpillar will replace its skin with a larger one capable of housing further growth. 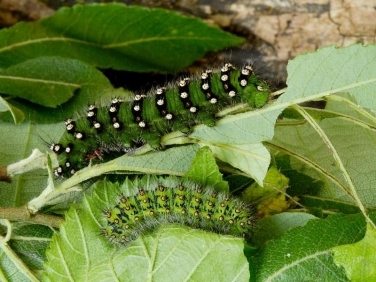 The two images above and the four below show the Emperor Moth (Saturnia pavonia) caterpillars growing from a few millimetres soon after they hatch to 65mm and fully grown in little more than two months. 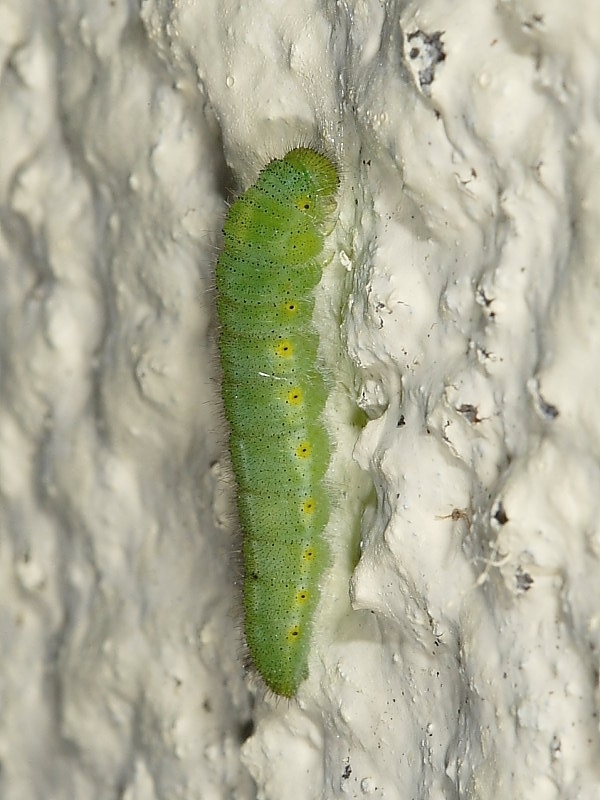 How many times does a caterpillar change its skin? 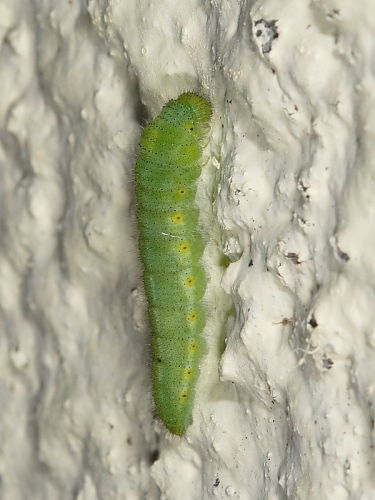 Most caterpillars change skins four times and the period between each new skin is known as an instar. Why do caterpillars grow so fast? 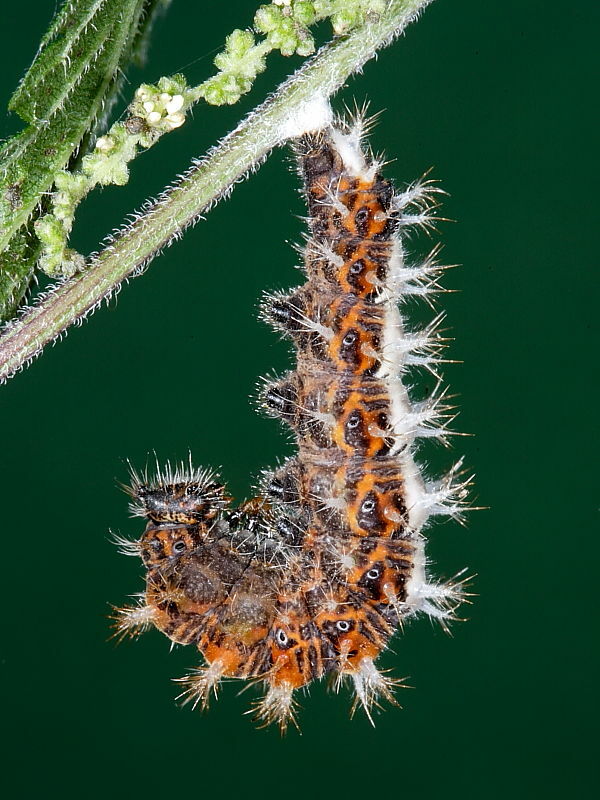 An important part of a caterpillar’s survival strategy is to grow rapidly because at this stage of their life-cycle many species are extremely vulnerable to predation and to have the best chance of survival they need to pupate within a short space of time. 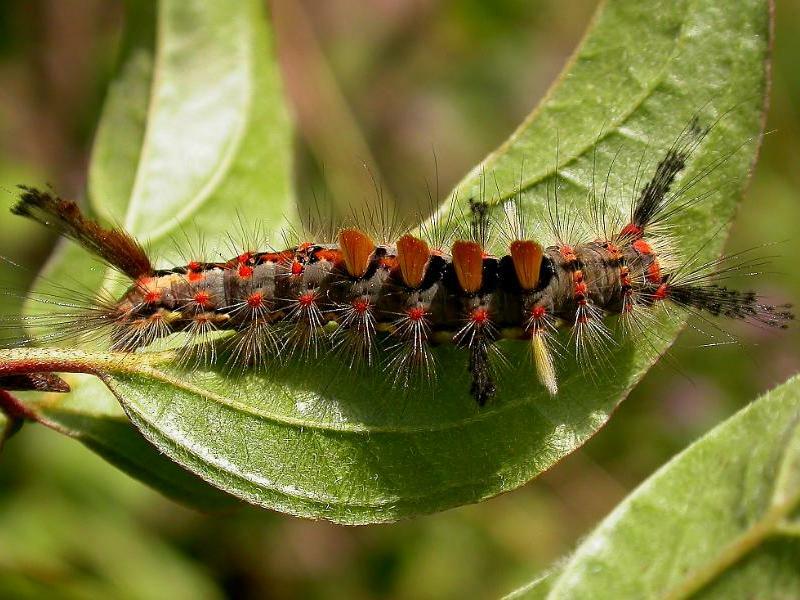 However, there are species that remain caterpillars for a prolonged length of time, some overwintering and in the case of the Goat moth caterpillar remaining inside the trunk of a tree for several years. 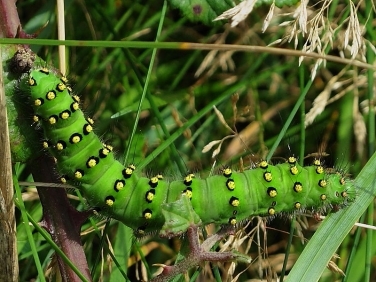 Do caterpillars change colour as they grow? Each change of skin may look very different from the previous one. For some caterpillar species, colour, pattern, degree of hairiness and even their shape can change between early and final instars. Why do some butterfly and moth species have broods containing different colour caterpillars? Many caterpillars not only change appearance as they grow and change skins but may even show different colour forms at the same stage of development within the same brood. 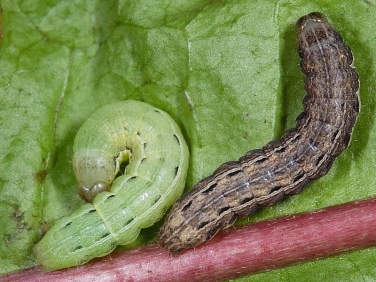 The Silver-studded Blue (Plebejus argus) butterfly (above left) and Large Yellow Underwing (Noctua pronuba) moth (above right) are just two of the many species of lepidoptera that have broods of caterpillars containing different colour forms, both these species having green and brown caterpillars of the same age. 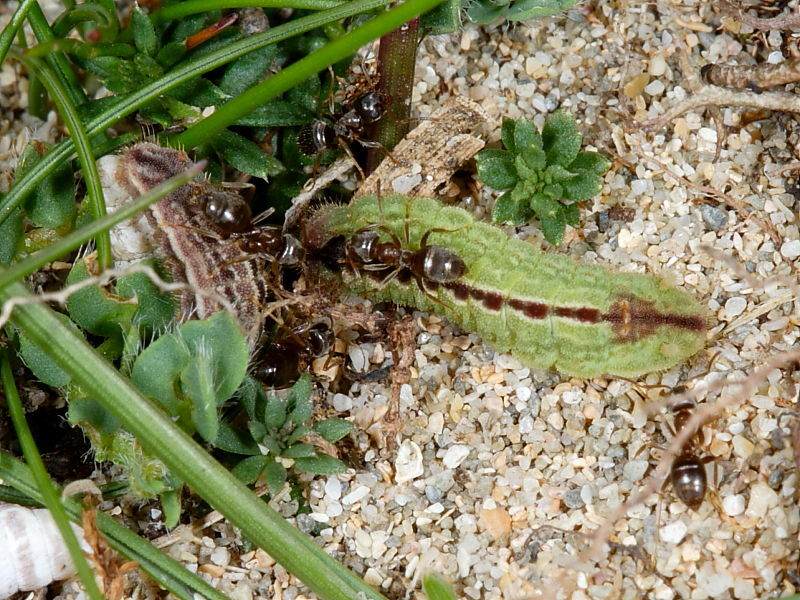 It seems likely this is to limit predation with one colour less easily seen than the other. Why does a caterpillar stop eating? The only time most caterpillars stop eating is prior to changing their skin or during the time leading up to pupation when their bodies have already begun the remarkable metamorphosis from caterpillar to moth or butterfly. 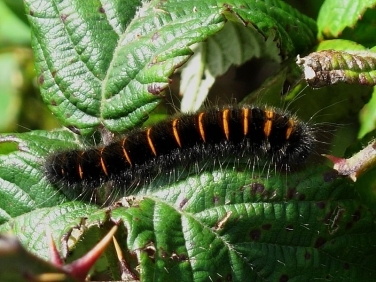 However, there are also caterpillars that over-winter, including several species of butterfly, that are able to go months without feeding. 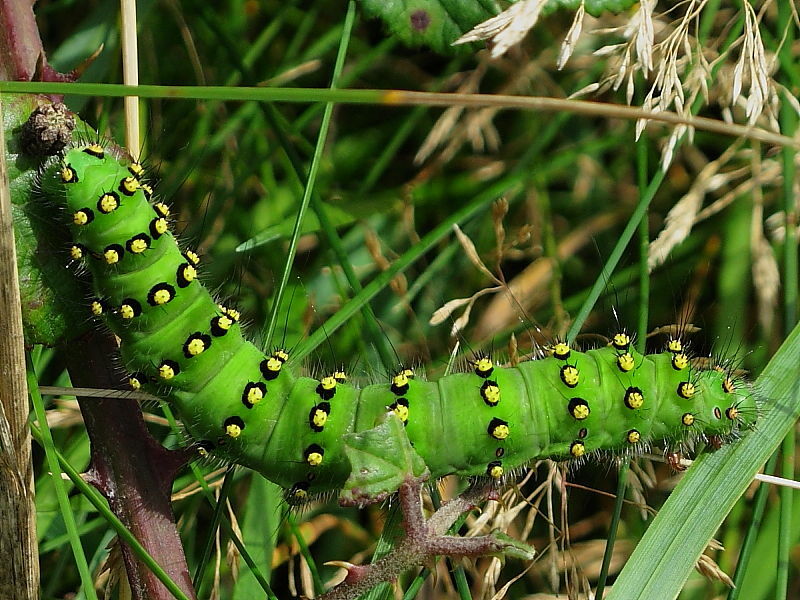 How long does a caterpillar stay as a caterpillar? The time it takes for a caterpillar to pupate varies widely according to species. 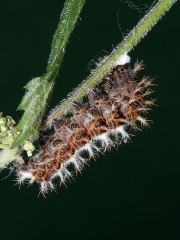 Many caterpillars are fully grown and ready to pupate within a few weeks of hatching from an egg, such as the Painted Lady (Vanessa cardui) butterfly (above left) that only takes 4 weeks. 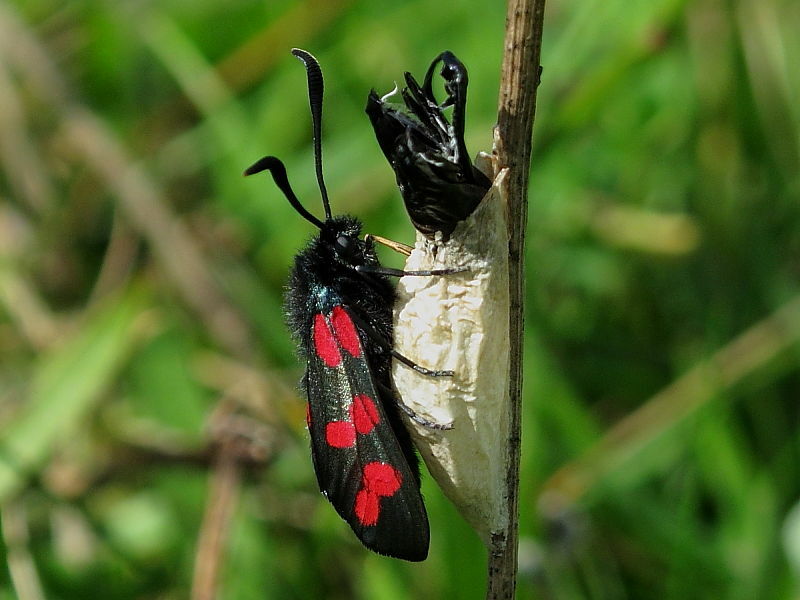 Others will over-winter in readiness to complete their growth and pupate the following spring such as the Fox Moth (Macrothylacia rubi) (above right) which remains a caterpillar for 11 months of the year from June to April. 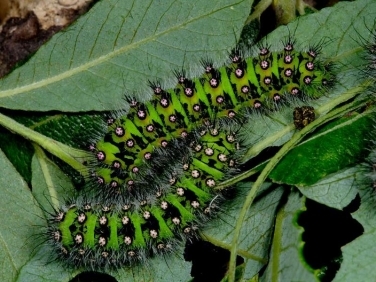 However, some species such as the caterpillars of the Goat Moth (Cossus cossus) may remain in the larval stage, inside a tree trunk, for up to five years. 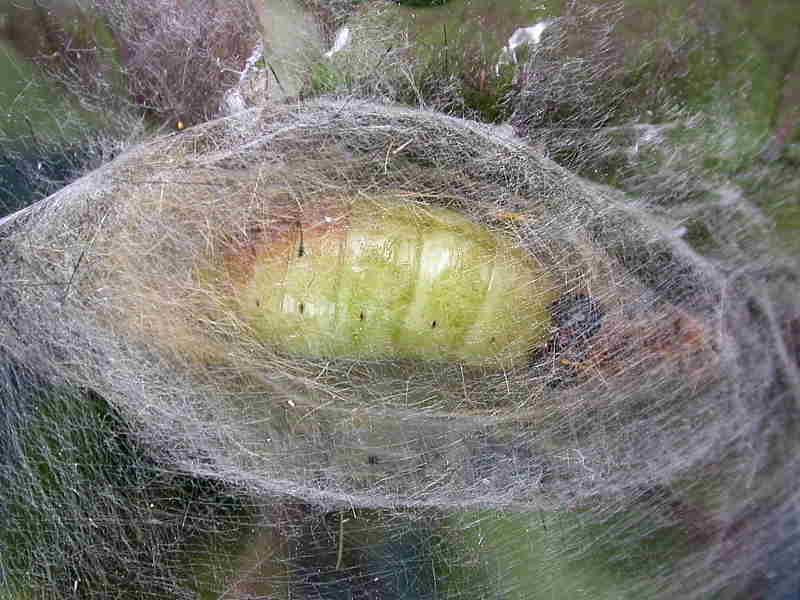 What is pupation? 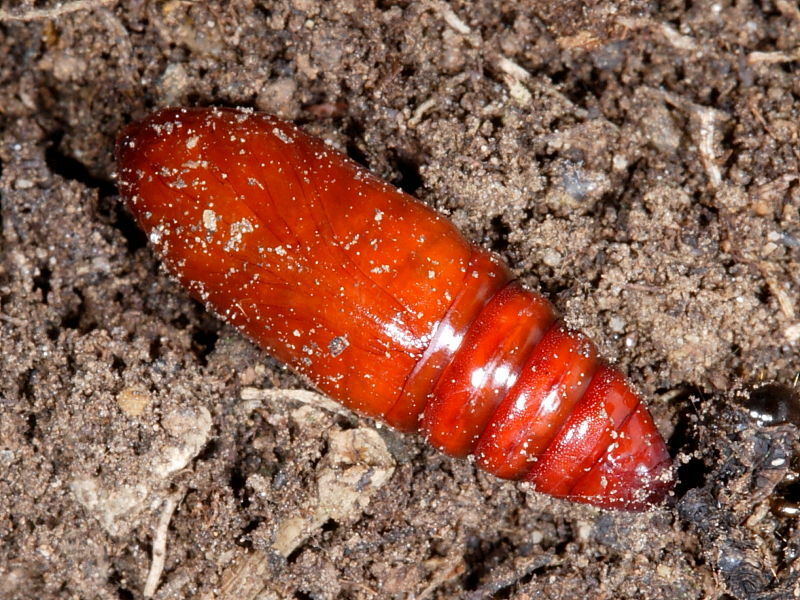 Why does a caterpillar turn into a pupa? Pupation refers to the stage when a caterpillar stops growing and undergoes a rapid and remarkable physical transformation into a moth or butterfly. 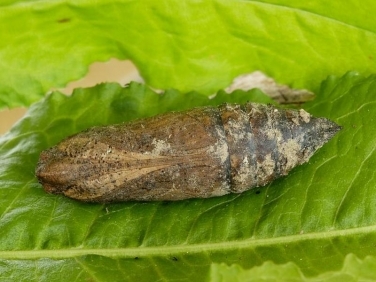 This radical change in the insect’s appearance is carried out from within a protective casing known as a pupa or chrysalis and is known as metamorphosis. What is the difference between a cocoon and a pupa? 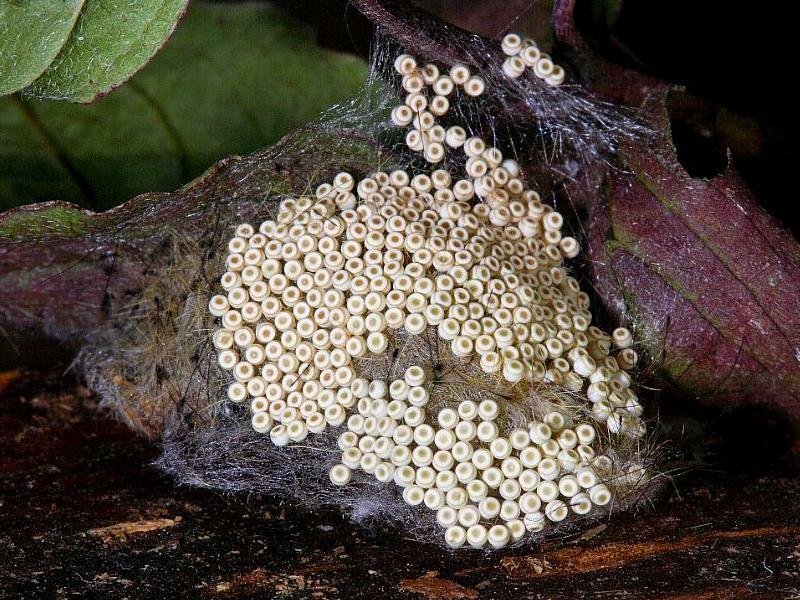 The caterpillars of some moth species spin an additional outer protective case known as a cocoon around them before forming a pupa inside. 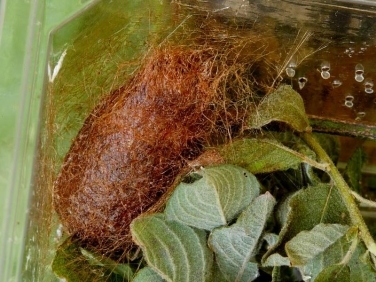 These cocoons are often spun using a mesh of spun silk and hairs from its own body. 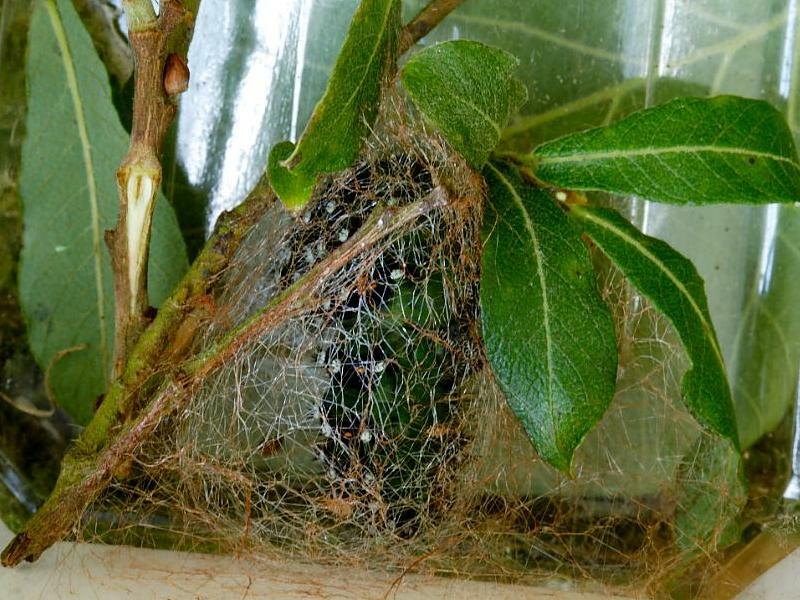 Many of these spun cocoons are rather flimsy and do not appear to offer much additional protection but their hairs may still prevent some parasites from reaching and penetrating the pupa and laying their eggs inside. However, some cocoons are of such a solid impenetrable construction that it has been suggested that some species may have developed a body acid to burn their way out. 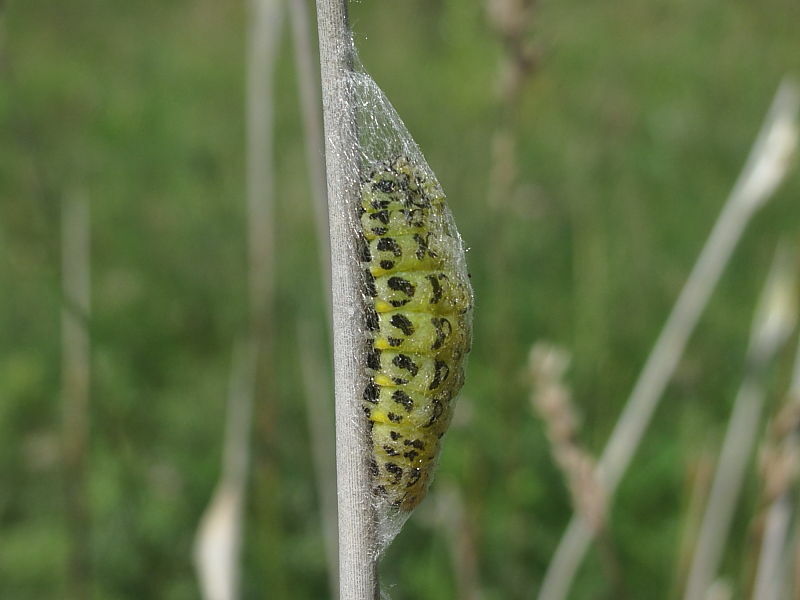 What is the difference between a chrysalis and a pupa? 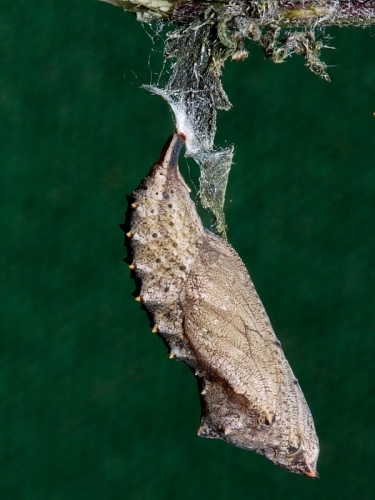 Butterflies and many species of moth don’t spin cocoons but instead pupate inside a single hairless pupal casing. 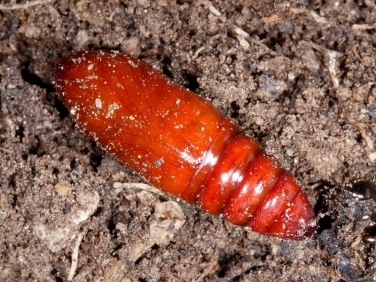 These pupae may be formed in a wide variety of places including amongst leaf litter, in the soil, inside the stems of plants, on the trunks of trees and even on man made structures such as walls of houses. 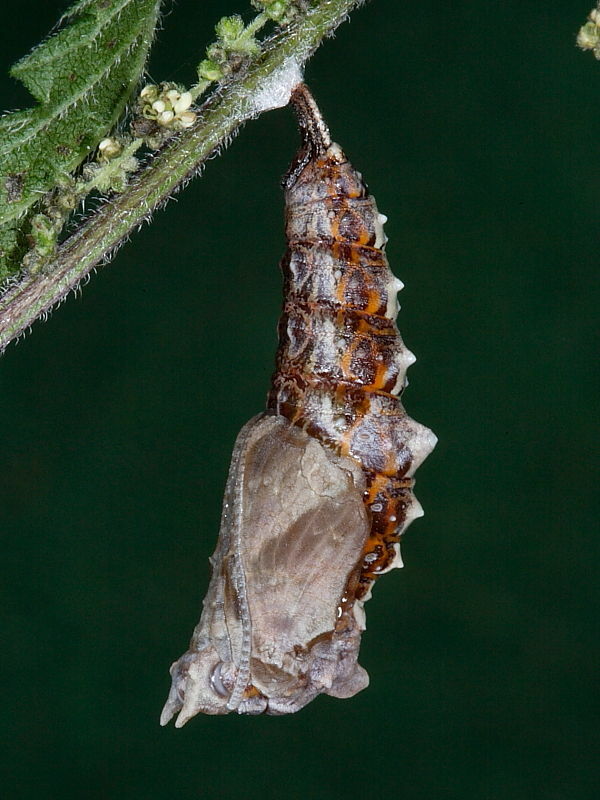 The word chrysalis is another name for a pupa and it comes from the Greek for gold. 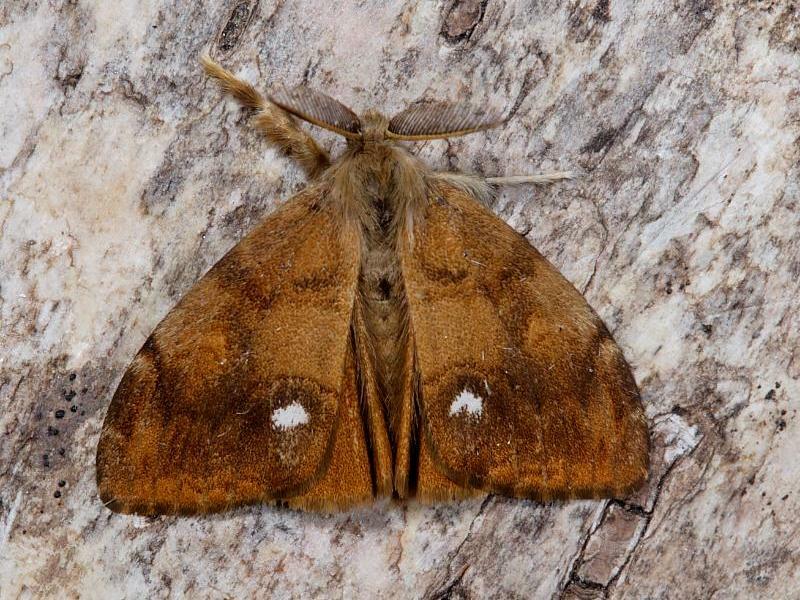 This refers to the golden brown colour of some pupae. 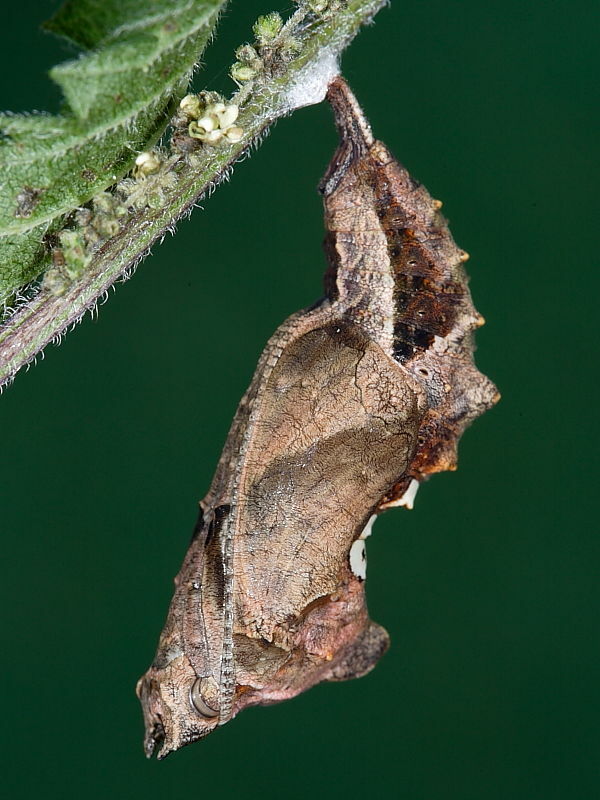 Although, many of these will darken with age as the moth or butterfly develops inside. 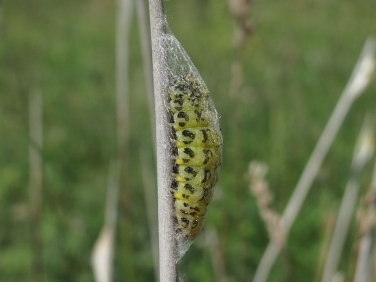 Chrysalis is more often used to refer to the pupation life stage of a butterfly and pupa for that of a moth. The Small Tortoiseshell (Aglais urticae) butterfly shown above secures its pupa to a plant, often the stem of nettles, where it is cryptically disguised to blend in with the colours and shapes of its surroundings. 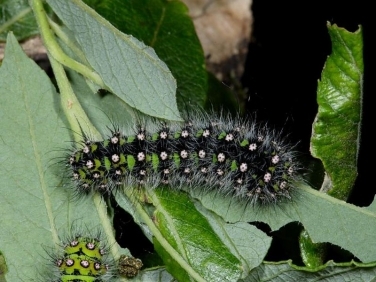 How do butterfly caterpillars secure themselves to plants when about to turn into a pupa? Some species, including many butterflies, such as the Comma (Polygonia c-album) butterfly (above) rely on a single shell pupa. 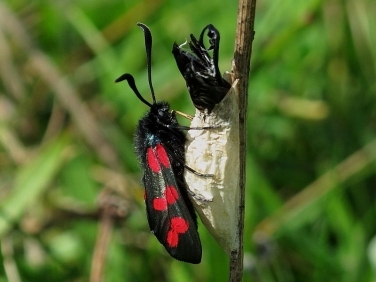 They fix themselves to their chosen support by hanging upside from a cremaster, tiny hooks at the rear of the pupa, attached to a silken pad. 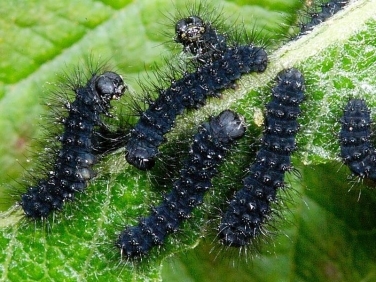 Some species such as the Green-veined White (Pieris napi) (below) secure themselves facing upwards and spin an additional silk gurdle as extra support.